The Summoner Wars Alliances Master Set is the ultimate Summoner Wars experience. Containing eight new faction decks, all playable right out of the box, a neoprene battlefield, wound markers and dice needed for play, and a storage solution that keeps your whole Summoner Wars collection together and organized, Summoner Wars: Alliances is the new high water mark in the Summoner Wars game world. The Fallen Phoenixes: Prince Elien is now immortal thanks to an unholy alliance with the Fallen Kingdom. Sacrifice life for fiery power with an explosive set of warriors whose attacks are guaranteed by your magic. The Tundra Guild: Empower your units (or hinder your opponent's) with powerful Rune Events which modify armies anywhere on the board. Master the use of the Ice Golem, and power your army with the knowledge of Scribes. The Cave Filth: The evil Filth Faction has subjugated the Cave Goblins. The Warden wields power ruthlessly, taking prisoners from his opponent's ranks as well as his own, and then using those prisoners to fuel his evil incantations and mutations. The Vargath Vanguard: Support your units with formations that boost attack values and protect your units from danger. Be bold and aggressively pursue the enemy summoner, knowing your summoner is tough enough to take care of herself. The Sand Cloaks: Teach your units flexibility with 9 different Event Ability cards, which can move around during the game, giving you the versatility needed to strike at just the right moment. Outmaneuver, survive, and kill. The Jungle Shadow: Don't wait for your opponent to come to you; be the aggressor, utilizing an army that cannot be held back and that will not be denied the taste of blood. Rush across the board and don't leave your enemy anywhere to hide. The Deep Benders: Control the game's economy of magic like never before thanks to boosted units, who can be summoned for two different costs. Endrich, the summoner of the Deep Benders, adroitly manipulates these boosts to leverage magic, choosing the perfect moment to power up and destroy the enemy. The Swamp Mercenaries: Grow your swamp of vine walls with the death of your enemies. With each wall, Glurblub's power grows stronger and the opponent's life is choked out. Turtles, rats and frogs all join the Swamp Orcs for the epic battle. The box is large enough to fit a complete, sleeved Summoner Wars collection and comes with deck dividers to keep your collection organized. The two-piece neoprene mat is the ideal playing surface. Summoner Wars is easy to learn--you'll be playing in less than 10 minutes. Yet the endless variety and superb balance of the faction's abilities and unique cards ensure a unique experience every time you sit down to play, as well as a deep sea of potential strategies and tactics. After playing 10 or so games with the Alliances factions, I was surprised at the depth that it adds to the respective groups. All of the new factions can benefit from the original faction decks and their cards fit well in many of those decks. Also, it allows for new ideas to be brought to the deck building side of Summoner Wars. I have always been impressed by the simplicity of Summoner Wars, it is easy to teach, but with the new dual-factions, I have to really think about the cards that my opponent may be playing. The Alliances set also adds many new mechanics, which add some life into this game. Examples include: the new Event Abilities for the Sand Cloaks, Runes for the Tundra Guild, and managing the Prison pile for the Cave Filth. This set is a must buy for any fan of Summoner Wars, but also is a great way to enter into the game. The decks may be more complex, but are still accessible to any player. I have taught this game with starter sets, the Master Set, and the Alliances set to players of all ages. These decks are more complex than the originals, but still very accessible to any player that picks them up. 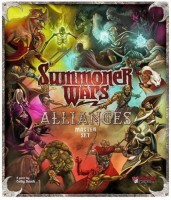 Add a Review for "Summoner Wars: Alliances"